DUMBARTON had their points lead reduced to one in front of an 850 crowd at Livingston in a vital Ladbrokes Championship clash. Now the Livi Lions are only point behind in the battle to avoid the relegation play-off spot, but Sons do have two games in hand. Stevie Aitken's men disappointed the manager and the 100-strong travelling support with an insipid performance. It looked as if they expected things to happen, while a battling home worked tirelessly and made things happen. 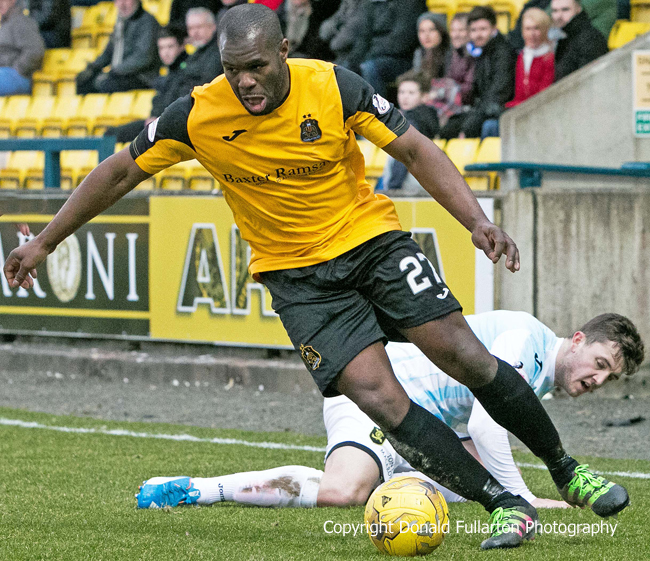 It did not help Sons cause when striker Christian Nade (pictured) missed out on two good first half chances, while shots from Tom Walsh and Calum Waters, and a header from Gregor Buchanan, were saved by keeper Marc McCallum. Livi had most of the pressure, and it told when poor defence allowed Liam Buchanan to open the scoring after keeper Jamie Ewings had blocked a shot. If the fans expected a different level of performance from the visitors in the second half, they were to be disappointed. Very few chances were created, and it was no great surprise sub Jordan White latched on to a McCallum kick-out, beat Fraser Wright and netted no.2 with a few minutes left. Sons skipper Darren Barr was foiled by McCallum as his team rallied in the final minutes, but the points were well earned by the home side.